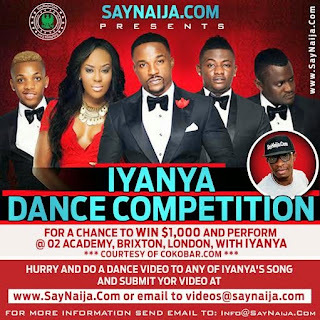 Nigeria's first Entertainment and Promotional Platform SayNaija.Com is currently promoting Iyanya’s Live Concert taking place on 25th August 2015 at 02 Academy Brixton, London. Interested individuals and groups are to dance to any of Iyanya’s song and submit their videos at www.SayNaija.Com or email to videos@saynaija.com. Iyanya Live in Concert is organised by the almighty Cokobar.Com that hosted my birthday in the UK last year. You should visit SayNaija.Com daily to enjoy interesting videos from Nigerian talents on comedy, music, nollywood, sports, fashion and 24hrs News with links to several media houses provided. SayNaija.Com is owned by United Kingdom entrepreneur Funsho Yusuf and partnered by Africa’s Number 1 comedian Basketmouth.